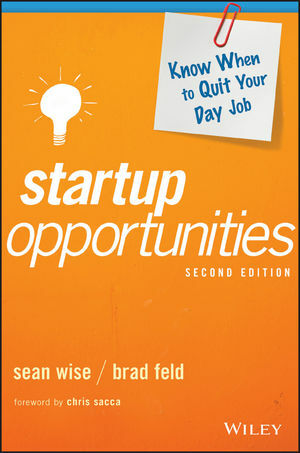 Startup Opportunities is the go-to guide for anyone with a great business idea. Whether it's your first business or your fifth, realistic assessment from the outset can save you a lot of time and money; why pour your heart and soul into a venture that is doomed to fail? Instead, position yourself to win from the very beginning. In this book, accomplished venture capitalists share their insight on startups and entrepreneurs: who will fail, who will succeed and why, and what you should do to give your business the very best shot at becoming a global success story. You'll learn how to evaluate your business with a critical eye, and how early customer development can be key in turning a good idea into a great opportunity. If you're serious about building a business that lasts, this book provides invaluable guidance that you really cannot miss. More than five million people will launch a business this year, and many of them will be great ideas—yet few will be around in five years, and even fewer in ten years. A great idea is not enough to build a successful business. You need to fortify your idea with the proper foundation, and a scaffolding of good planning and early action. This book shows you how. This expert author team has witnessed more than 30,000 pitches over two decades, and have participated in over 500 startup launches. Startup Opportunities gives you the benefit of their experience to help you start strong and stay strong. SEAN WISE is an expert on startups and venture capital. He hosts The Naked Entrepreneur, which airs on the Oprah Winfrey Network, and is a prolific business educator, bestselling author, and an international business speaker. He is a partner at Ryerson Futures, a seed-stage venture capital fund and technology accelerator. BRAD FELD has been an early-stage investor and entrepreneur for over twenty years. Prior to co-founding Foundry Group, he co-founded Mobius Venture Capital and Intensity Ventures, a company that helped launch and operate software companies. He's also a co-founder of Techstars.